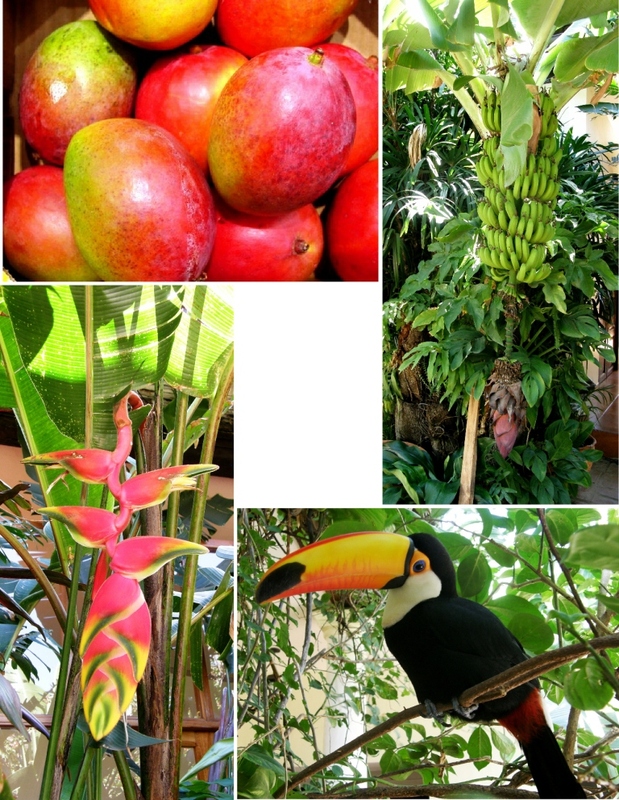 Santa Cruz, Bolivia has almost all the lovely things that the tropics typically have to offer…swaying palm trees, avenues lined with mango trees dripping with fruit, exotic plant and birdlife and tremendous afternoon downpours of cooling rain (sadly few and far between these days). Too bad there aren’t any beaches in this country to complete the picture of tropical paradise. For those of you in the wintery whiteness of the northern hemisphere, here is a bit of tropical Bolivian color to brighten your day. 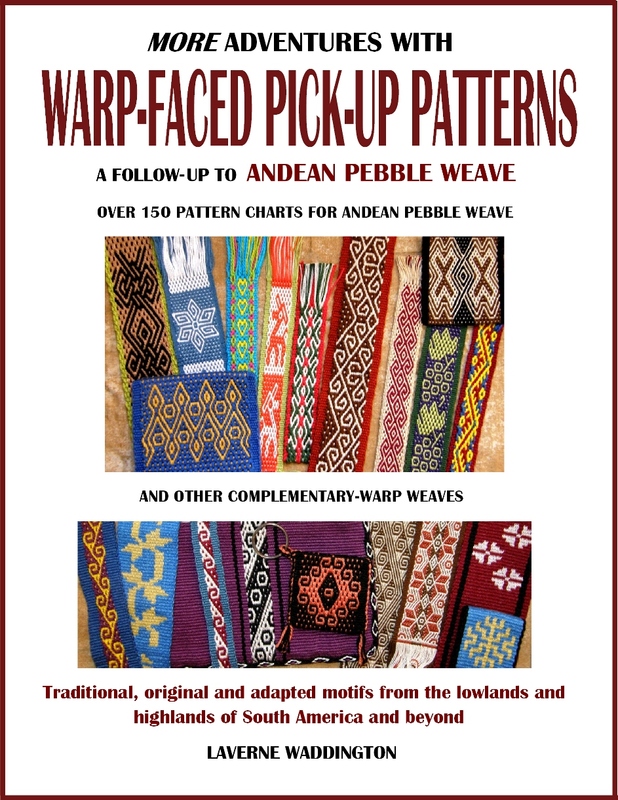 The main inspiration for the patterns has come from a particular Guatemalan plant motif woven using supplementary wefts. 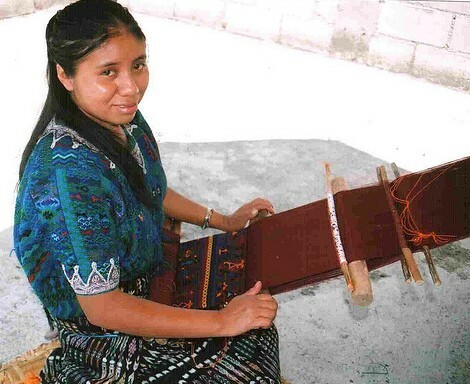 Carmen, pictured at left, taught me to weave this in her home of Santa Catarina Palopó on the shores of Lake Atitlan. The small plant motif uses inlaid supplementary wefts for the leaves and various warp wrapping techniques to create the stem and plant base. I took the leaf pattern, changed it a little to fit my working space, and used it in the side panels of the scarf. I also expanded it into an imaginary tropical flower. 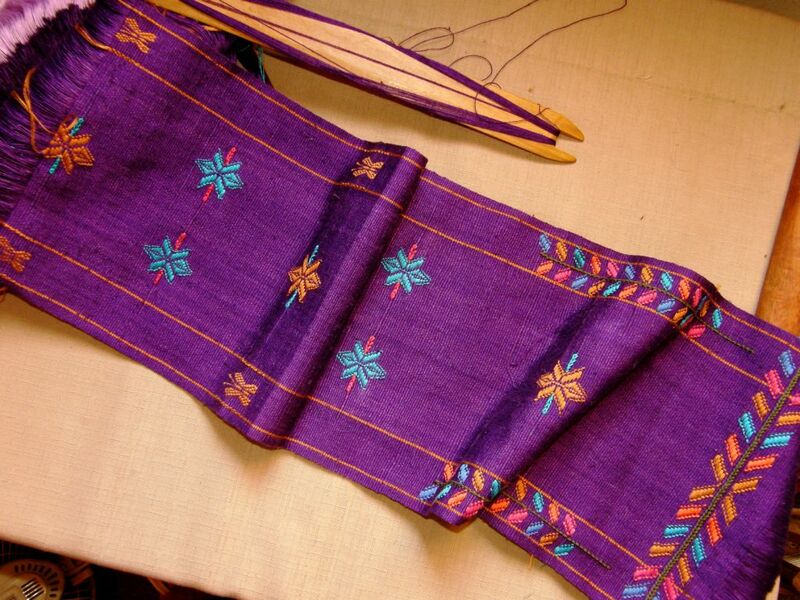 The tiny butterfly motif was adapted from one on a Mexican backstrap-woven textile that I saw online. How is that for inspiration?! And I got to meet Lisa and see this piece in person at Maryland Sheep and Wool last year where the shawl took Best of Show. Lisa has done some backstrap weaving with me so maybe that will somehow influence one of her projects. Take a look at her Flickr page to see more amazing creations in deflected double weave. I like how my purple scarf doesn’t really scream “me” at all…at least I don’t think it does. I once had someone on Weavolution say that she could immediately spot a project of mine before clicking on the image to see who the weaver was. It’s nice in a way to know that you have developed a sort of weaving “character and style” that can be recognised.On the other hand, it’s nice to branch out and do something completely different and I have realised that, in order for me to do so, it is helpful to have access to yarn that I have never used before. So, I think that along with my “wider, longer, finer” weaving goal for this year, I will add “new fiber”. 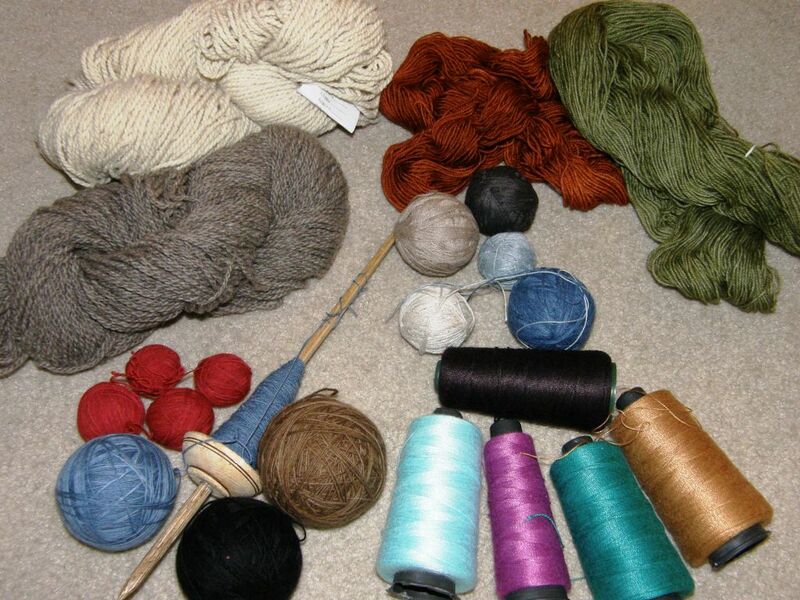 I intend to quieten the little voice that tells me to “keep it simple and just make do with what you can get locally” and take advantage of my trips to the US to gather up new-to-me fiber and a greater range of colors. Above you can see alpaca, wool, hemp and bamboo (?…this was a gift and I am not sure what it is) yarn from a recent US trip….much of it gifts from weaver friends. Now, back to the current project. What about that coil rod…what has it been doing for me? I roll it along the warp as my weaving progresses and the fabric gets rolled around the loom bars. It is definitely a handy width guide. Beyond the coil rod the warp tends to spread and fan out as it stretches away toward the far loom bar. The rod also ensures that there is always beautifully consistent tension between it and the weaving line. It locks the warps into place and gives me even tension with which to work no matter how many stretched and loosened warps may be gathering beyond it and on the lower layer of warp beyond the far loom bar. In short…I like it! It is a great little tool. You can see the coil rod in place in the above picture. Other “tools” that I am using on this project are several ties of colored yarn along the shed rod and in the heddles. Because my patterns are not wide enough to warrant the insertion of pattern sticks to raise the warps under which the supplementary wefts pass, I am using little ties to raise the appropriate warps instead. There are some that go around the warps themselves in the shed-rod shed and others which are tied around certain heddle strings. I simply pull on these to raise the pattern warps in the heddle shed. They save time and prevent eyesight strain! 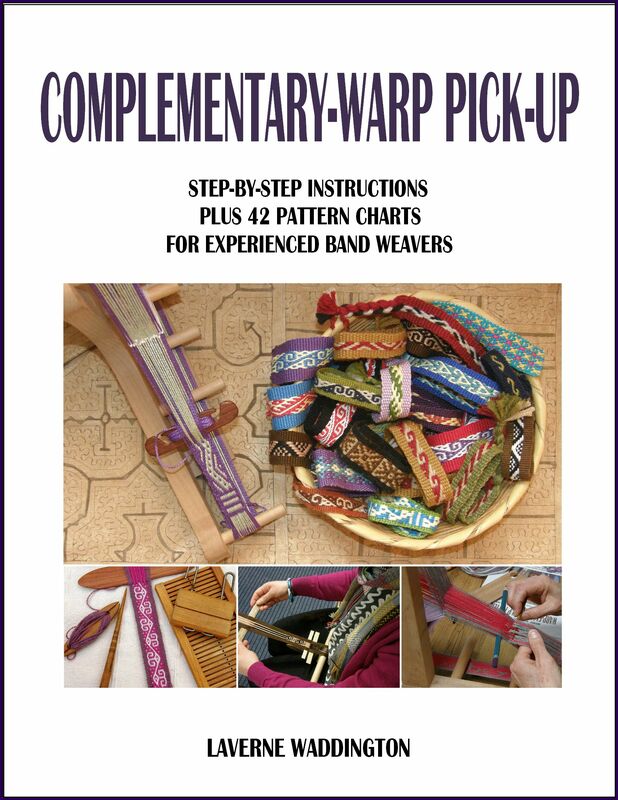 It always delights me to see that the use of simple sticks to carry the weft is common to many backstrap weavers around the globe….no fancy tool required! You have seen in my pictures that I use a specially shaped shuttle. Three of these were made for me when I lived in Chile and they have a kind of sentimental value. I enjoy using them and they double as beaters and swords sometimes so they are pretty nifty. 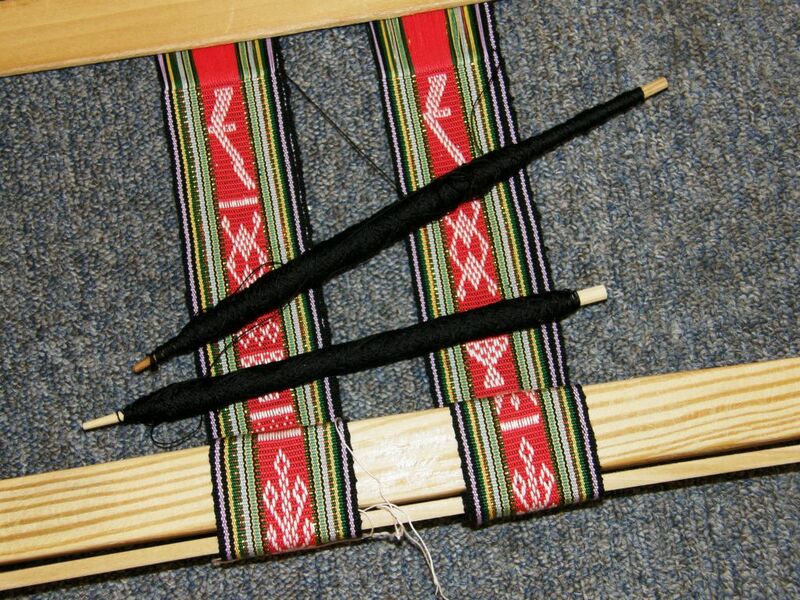 The Montagnard backstrap loom above has two bands in progress and you can see the two simple shuttles. The looms are so large that it quite cumbersome to balance them when only weaving one narrow band. 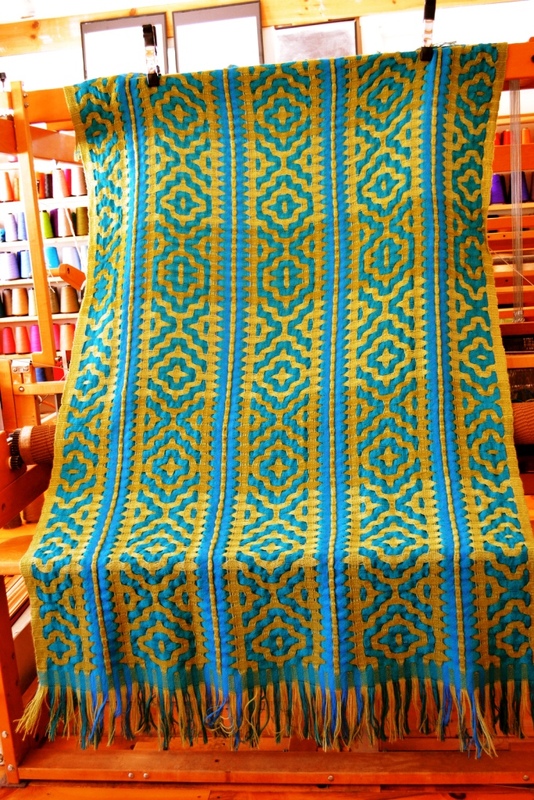 They are designed for weaving large panels of cloth which are used for skirts, shirts and blankets. 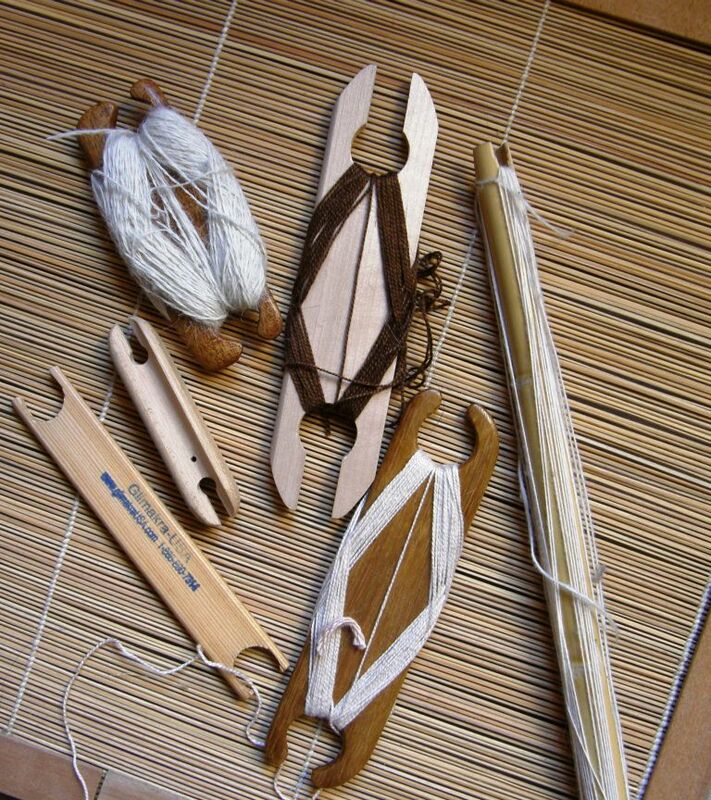 The long thin shuttle on the right is one that one of my Guatemalan weaving teachers used. All my other teachers have used simple sticks about which the yarn is wound or, for narrow pieces, simple “mummy”-like butterfly bundles. Below you can see two such weft bundles. The yarn feeds off the outside rather than from the center and a hitch is put in place to stop the bundle from unravelling when it hangs freely. 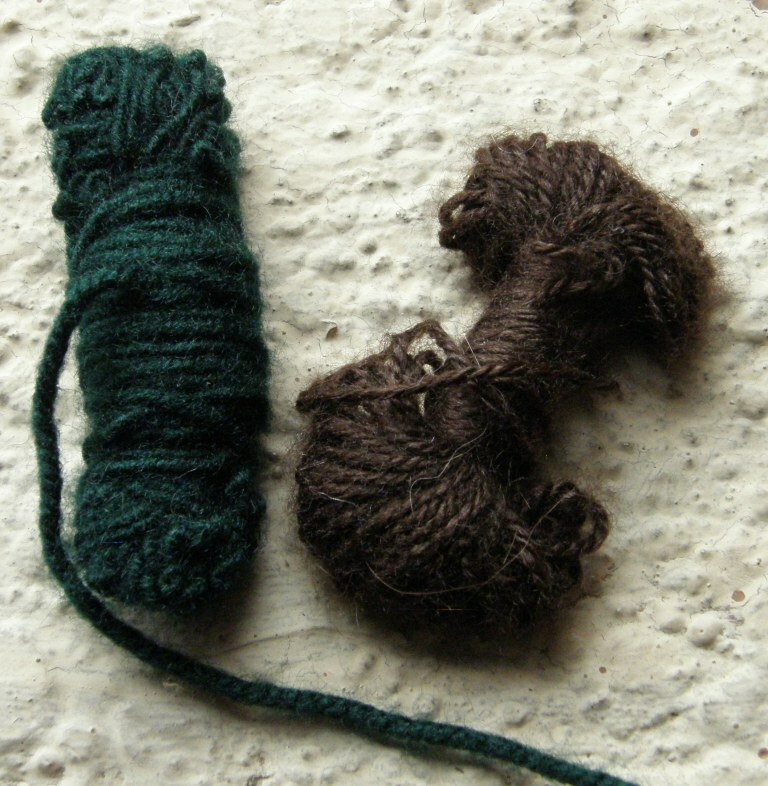 These two examples are of handspun wool and alpaca fiber from the Cusco area. 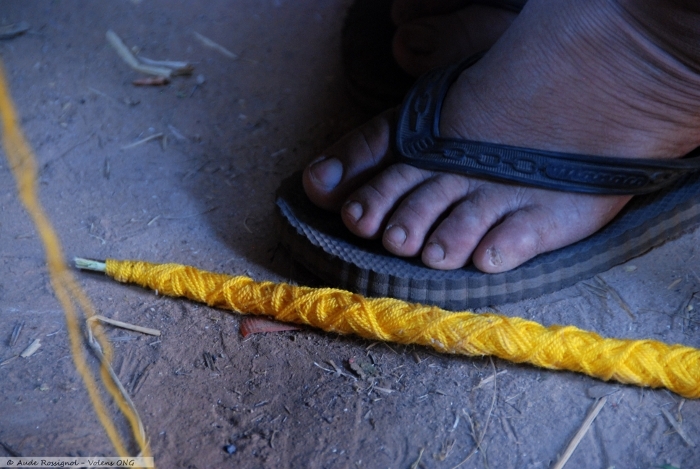 For narrow work my Guaraní teacher uses short lengths of scrap yarn for weft. This way she never wastes a thing! The weft lengths are so short that she does not even need to wind a butterfly. For wide pieces a simple stick shuttle is used as seen below. Permission to use this image was kindly given by Aude Rossignol. 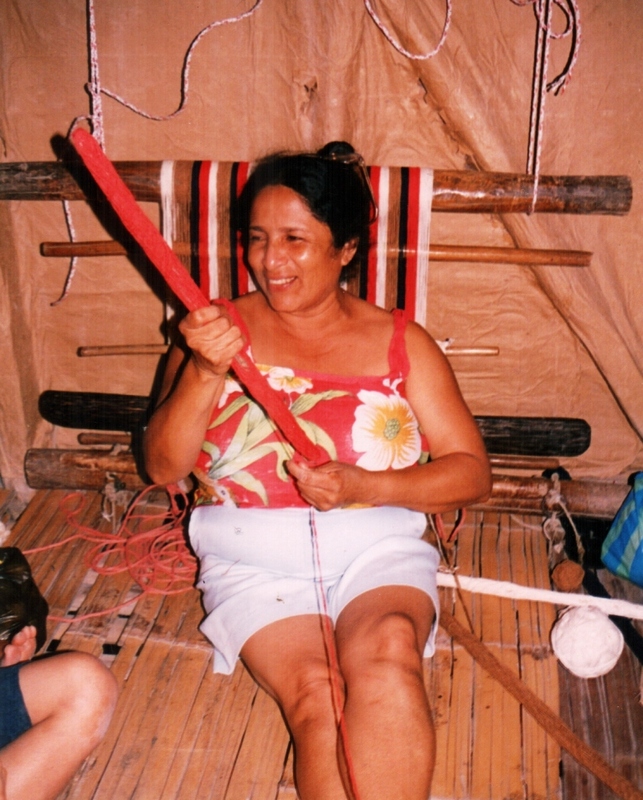 Here is a video showing my Montagnard weaving teacher, Ju Nie, loading yarn onto her shuttle. You can see that her shin is a very useful piece of equipment as, in a previous post, I showed you how she also uses it to help twist the fringes of her woven projects. The video has two segments with a short pause between. 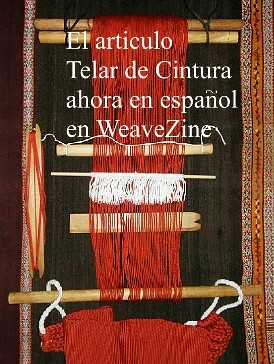 Wait for the second part which shows a weaver from the Cusco area loading her large shuttle. 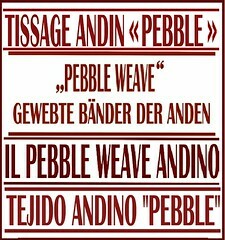 One of the most charming ways of passing the weft is one in which the weaver has her weft rolled into a ball. She places the ball within the shed and then tilts her body to angle the loom so that the ball rolls through to the other side! And finally, here is my teacher Trini in coastal Ecuador loading one of the three shuttles for the mini hammock she is preparing to teach me to weave. It was a balanced weave using three weft colors. In the Ravelry Backstrap Weaving Group, Marge and Julia showed what they have been working on lately. Marge has been trying out Tahki Cotton Classic Light. I have not tried the Light version but I did see it at WEBS when I visited and the color range is wonderful. 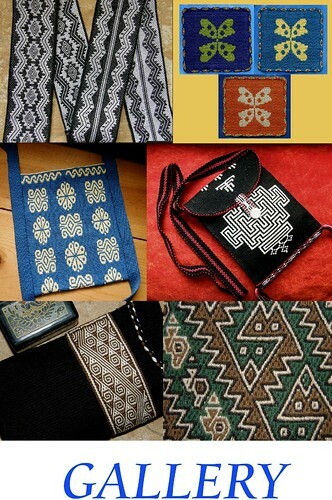 Marge used an online inkle pattern generator to help her design the color arrangement. The result is gorgeous! 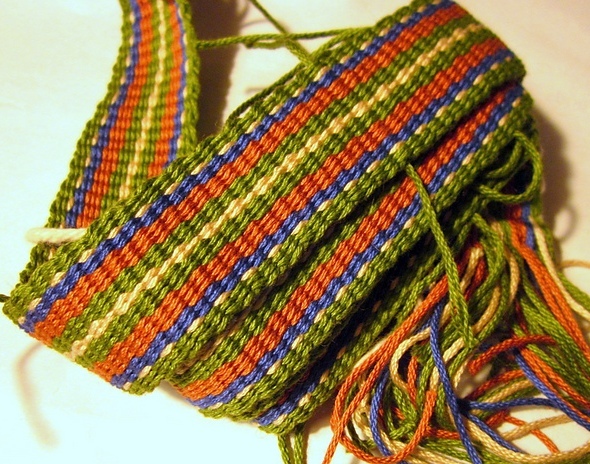 Julia used two different color ways for the same pebble weave motif (charted in my second book) on two different looms…a four-harness and a Seidel Band Loom. I will be visiting the Mannings this summer. If you want to come and weave, maybe we can spend a little time outside hitched to some shady trees down by the creek….on the ground or on chairs..that will be up to you. How cool would that be?! The scarf is absolutely beautiful! The colours are wonderful together, very summery! Laverne, your scarf is stunning. The colors are not typical for you, but they really go well together. Thanks for sharing your processes. thank you for sharing the video on loading the stick shuttle, I had looked everywhere trying to find something that showed this information. The colors of Bolivia and your scarf are absolutely yummy! Sigh. And the designs on your scarf are so sweet. 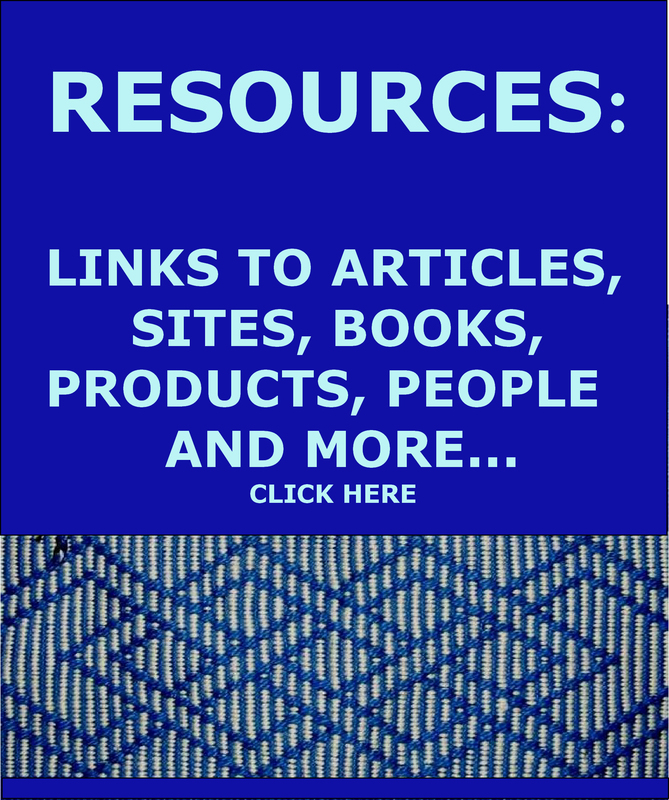 I just purchased my first backstrap loom and have been eagerly perusing your site here…..thank you sooooo much for sharing so much information!!! I hope to be warping in the next couple of days for my first experiment! wheeee! Not sure what I’m using as a shuttle yet, probably whatever I can find or make with relative ease. Again, thanks for the info and inspiration! Love your work. Thank you Laverne for another great post. You never disappoint. I really needed an infusion of color to brighten the very cold and dreary day here on the mid-Atlantic region of the U.S. Your newest scarf is stunning.